We are a family that loves cereal. We love all kinds of cereal. Lucky Charms, Cinnamon Toast Crunch, Reese’s Puffs… you name it, and we’ll eat it. And not just for breakfast either. I’ll eat a nice, big bowl of cereal for dinner when I’m too tired to cook and be perfectly satisfied. But on weekends, I get the urge to treat my family to a delicious, not-out-of-a-box breakfast that will totally blow their minds. This recipe, my friends, does just that! 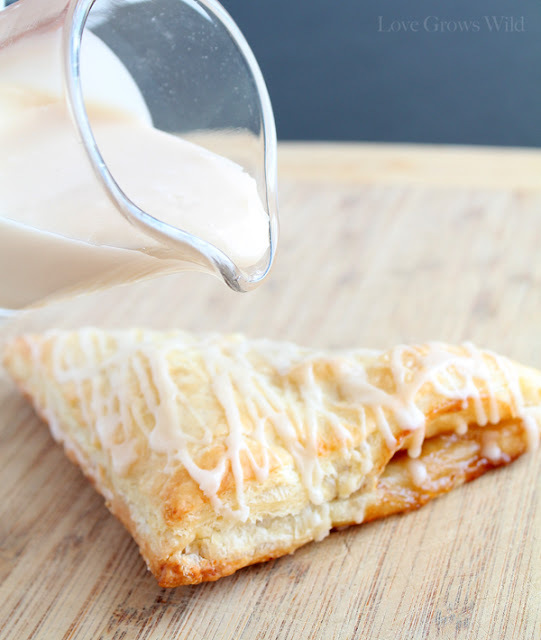 My Apple Turnovers with Vanilla Glaze are not only the perfect breakfast pastry, but make a wonderful sweet treat any time of the day! And the smell that fills your kitchen while cooking these scrumptious turnovers is absolutely heavenly! The turnovers are a cinch to put together with the help of frozen puff pastry. 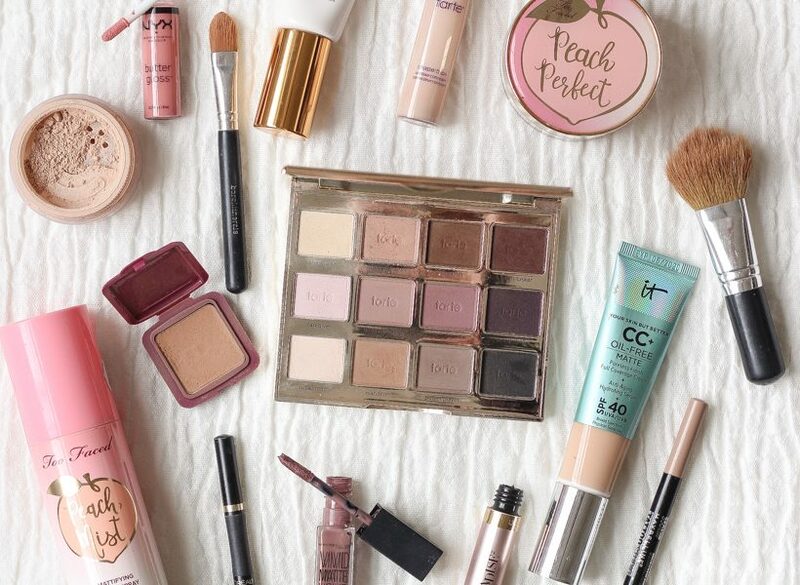 If you’ve never tried using it before, now is definitely the time! It bakes up beautifully with lots of flaky, delicious layers. 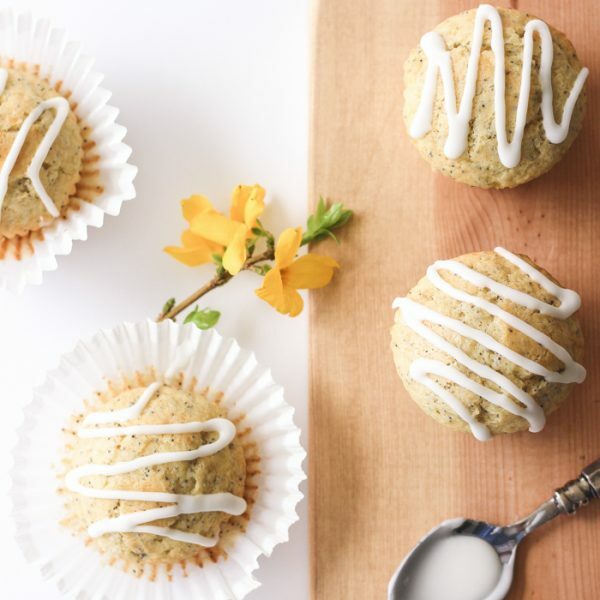 I keep some in the freezer all the time to whip up quick pastries and desserts like this! 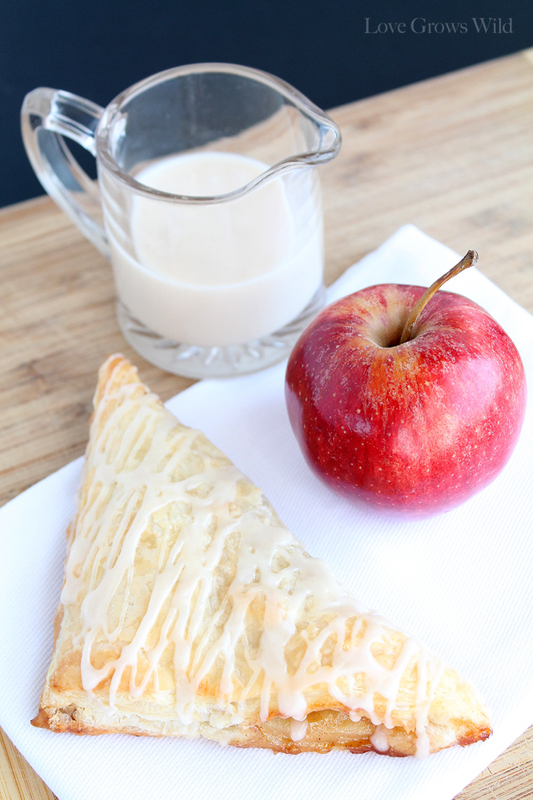 I like to use two different apples for these turnovers to get the perfect mix of sweet and tart. Fuji and Granny Smith apples work great! The apples are sauteed in butter until tender and a mix of brown sugar, cinnamon, ginger, nutmeg, lemon juice, and vanilla creates a wonderful, thick sauce around the apples that smells out of this world! I could probably eat those apples straight out of the pan! And as if the apple turnovers aren’t already delicious enough, I add a vanilla glaze that sends them totally over the top! Drizzle on a little or drizzle on a lot… you decide! Either way I know you are going to love these turnovers! Heat oven to 400 degrees. Melt butter in a large skillet over medium heat. Add apples and cook 2 minutes, stirring occasionally. Add brown sugar, cinnamon, cornstarch, ginger, nutmeg, and lemon juice. Cook and stir 3 minutes until apples are tender and sauce is thickened. Remove from heat and add vanilla. 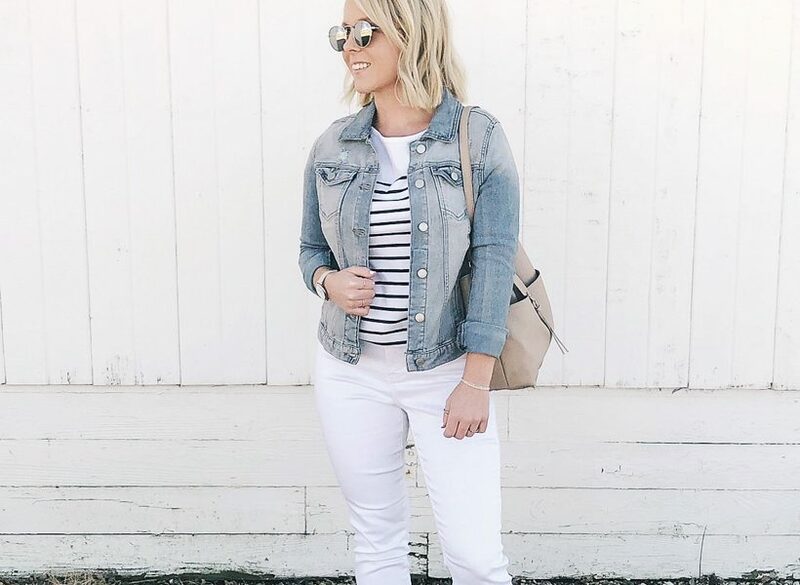 Cool slightly. Meanwhile, unfold pastry sheet on a lightly floured surface. Pinch together seams if necessary. With a sharp knife, cut each sheet into four squares. Mix the egg white and water in a small bowl and brush the edges of the pasty squares with egg wash. Spoon 1/8 of the mixture into the center of the 1 pastry square. Fold pastry in half diagonally and pinch the edges with a fork to seal. Transfer to an ungreased baking sheet. Repeat with remaining squares. Bake at 400 degrees for 14-16 minutes until the top is puffed and nicely browned. 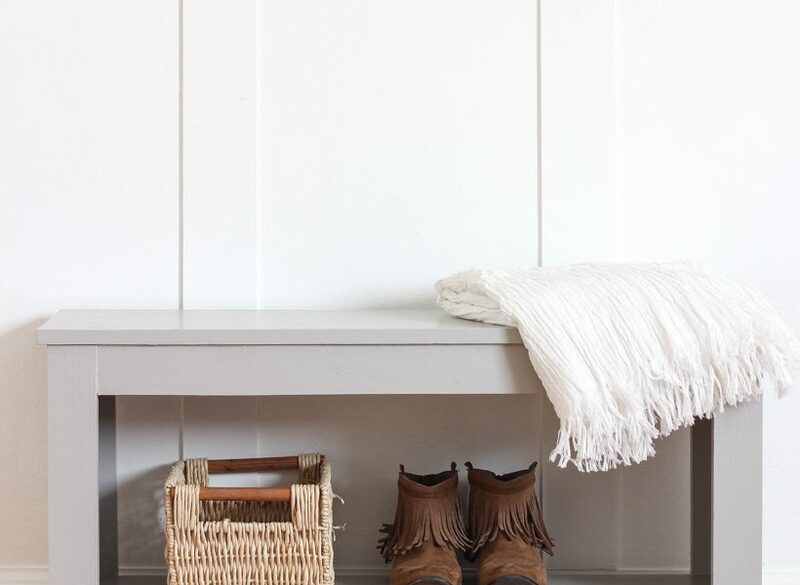 Remove turnovers from pan to a wire rack and cool 10 minutes. In a small bowl, combine powdered sugar, milk, and vanilla. Mix to a smooth, thick consistency. Add more milk to thin, if necessary. Drizzle glaze over warm turnovers and serve. 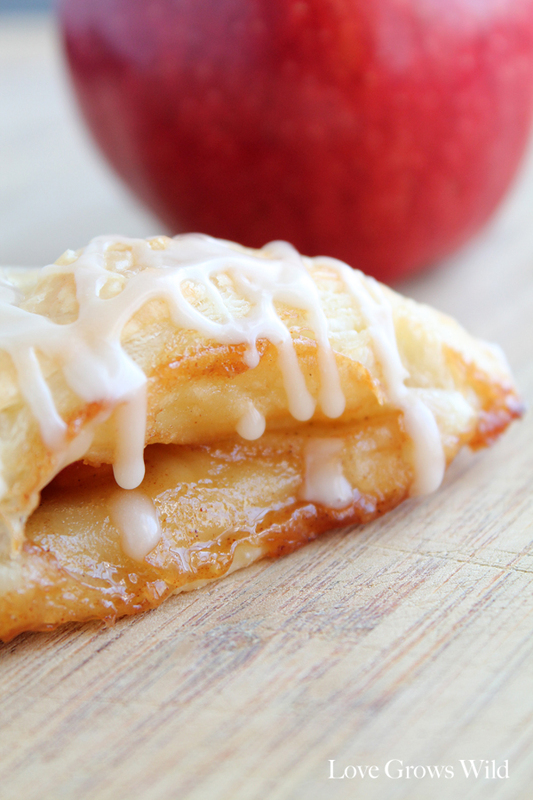 *Apple Turnovers are best served the same day as baking. They can be reheated in a 350 degree oven for 5 minutes to bring back that fresh out of the oven taste! 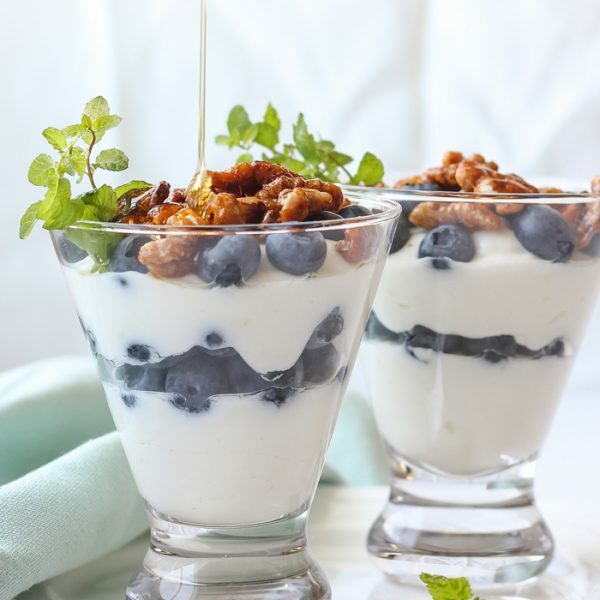 PREVIOUS: Fun Recipes to Make With Your Kids This Summer! I like to keep puff pastry in my freezer for quick treats too!!! 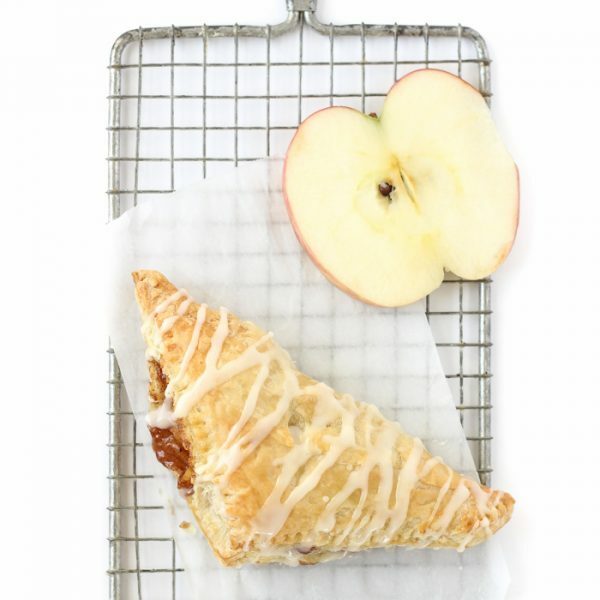 These apple turnovers sound like the perfect treat any time of day!!! Delicious!! Can’t wait to give this a try! 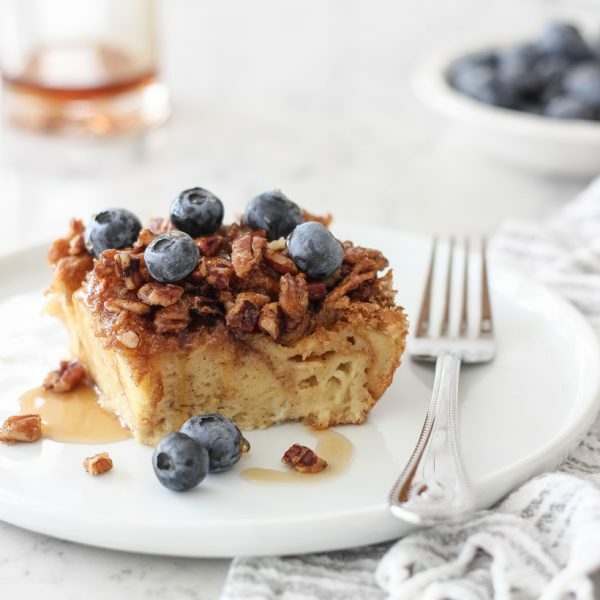 I love fun recipes like these for a Saturday or Sunday morning. 🙂 I just joined your site via GFC. I’d love for you to visit mine over at gloriouslymade.blogspot.com. This looks amazing! I would love to have some for breakfast! I have apples but no puff pastry on hand…hmmmm. What could I make? 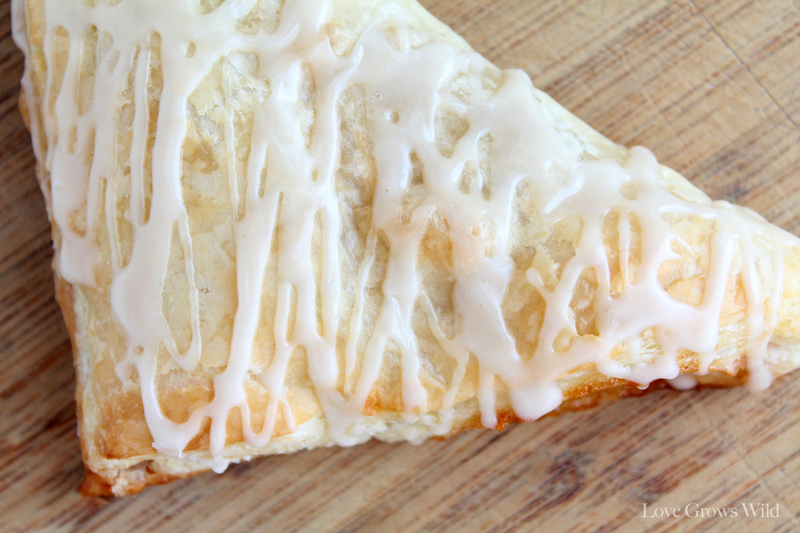 These look yummy…i love turnovers for breakfast so i will definitely be trying these soon! Oh that looks amazing and so delicious! 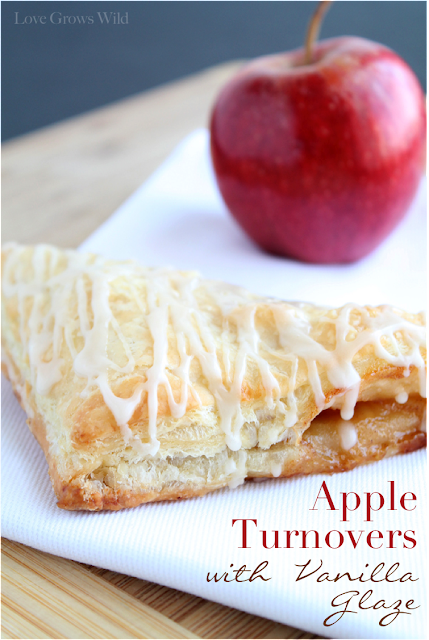 I love apple turnovers, I definitely have to try this recipe, thanks for sharing. I wanted to invite you to share this recipe on my new blog link party, Sweet Tooth Tuesdays. These look great. Thanks for sharing. My mom made these, and I, too, keep puff pastry on hand. I love your process photos. Very pretty. These look SO good! Apple turnovers are one of my favorites! I agree. Breakfast or any time of day, I want to eat these! Looks delicious! I pinned these to my Breakfast and Dessert boards. They look AMAZING! Thanks for sharing with us! These look yummy! I’ve pinned for later. Stopping by from the Whipperberry Blog Hop. I love apple turnovers! Thanks for sharing!! YUM! Yes please! These look great! 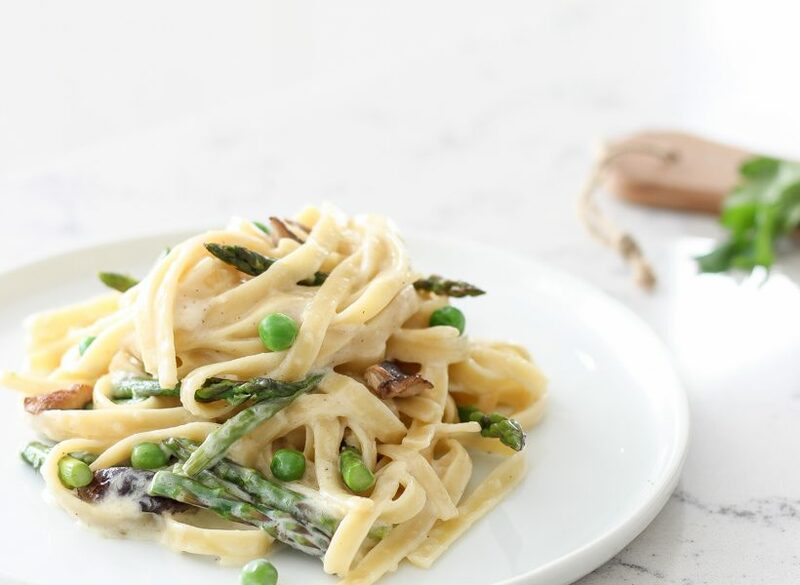 I just saw your yummy looking link over at Too Much Time On My Hands Link Party and thought I’d stop by and check out your recipe 🙂 I’d love for you to link up with me at The Weekend re-Treat on The Best Blog Recipes going on right now! We’re also having a GIVEAWAY this weekend and I’d love for you to enter to win while you were there! These look awesome, Liz!! And your photo are stunning. Oh my goodness, I want one of these right now! I’d love it if you would share this at my Saturday Spotlight link party. These look so good! And not too hard to take a stab at making! What beautiful turnovers Liz! I want a bite so bad! I think I need to get some frozen puff pastry! These look amazing! I LOVE cereal too! And this looks incredible, I’m so excited to try it! Oh my goodness, these look amazing! I am going to make these tomorrow for our dinner guests. I am wondering how many this makes? Want to make sure I make enough! 🙂 Thank you! Hi Sarah! This recipe will make 8 turnovers. I’m sure your guests will love them! Let me know how they turn out! Oh my goodness, these look so good! I am going to make these tomorrow for our dinner guests. I would love to know, how many does this make? I want to make sure I make enough for everyone! 😉 Thank you! I just made these and ate THREE! So delicious!! Made them this morning and they were easy to make and delicious! My only change was to add an extra apple and water to the apple mixture. I think next time I will cut the cornstarch amount in half because it was so much that I was forced to add water, otherwise it tasted like raw cornstarch. Bu that was it. I will make again, thank you for the recipe and lovely photos! These were amazing! I only had one pastry sheet, but if I made two I would certainly have to double the filling recipe 🙂 I left out the lemon juice because I forgot it at the store, but still perfect regardless! I made these tonight and they were so delicious and easy. Thank you Liz! These turned out beautiful! My first experience making turnovers. I used to XL honey crisp apples. When diced small, I ended up with 3 cups. I started filling the turnovers with 2 T. of apple mixture and realized that was to much, so I cut it back to 1 1/2 T. and it turned out perfect. I bruised the tops of the turnovers before baking. They look beautiful! I lined my baking sheet with parchment paper, I would recommend this. Thank you for the recipe!